A little over a week ago, right after Kobe Bryant passed Shaq on the all time points list, I happened to be listening to Colin Cowherd on the radio and of course, Kobe’s place on the list of all time Laker greats came up. During this conversation, Colin mentioned the fact that if you were to construct a roster of all time Laker greats in their prime, you would have people like Jerry West coming off the bench. He correctly pointed out that with any other NBA team (except possibly the Celtics), if you were to try to construct an all time team out of their players, by the time you got to the 6th or 7th player, you would find yourself playing relative no names or role players off the bench. This of course got me thinking. What would the Spurs “All-Time In Their Prime” Team look like? How good would they be? Where would they rank on a list of other franchises All-Time Teams? I had the feeling they wouldn’t fair all that badly, so I compiled a list to prove it. Before I got started, I had to set up parameters. In order to qualify for this list, each player had to have played for the Spurs for at least 5 years and at least two of those years had to have come during that player’s prime (between the age of 25-32). After several days of compiling stats and considering the merits of championships won verses all-star appearances and all-NBA honors here is the list I came up with. Artis Gilmore, Avery Johnson, Steve Kerr. Robertson may not be a household name, but at # 10, that not a bad way to start off this list. 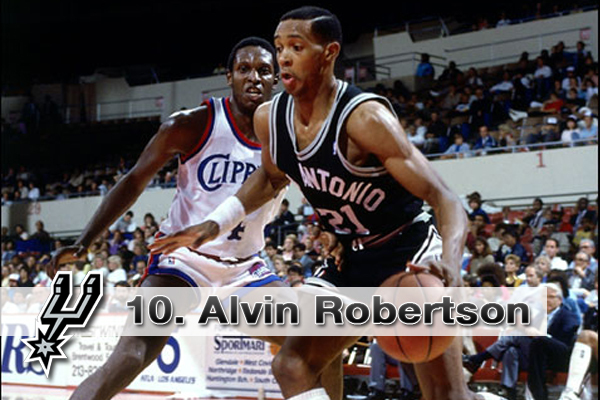 Robertson played for the Spurs from 84-89 and represented the silver & black in 3 All-Star games during that tenure. Although he amassed just over 10,000 points in his playing career, Robertson was better known for his defense, winning in the NBA Defensive Player of the Year in 1986 and making a cumulative 6 appearances on the NBA All Defensive 1st or 2nd team. Throughout his playing career, Robertson was know for his thieving ways, recording 2112 steals, good for the second most in Spurs history. I had to fudge this one a little bit, as the first of Kenon’s five years with the Spurs was while they were still playing in the ABA, and while technically, that may disqualify him, his overall body of work and what it meant to the infant Spurs was enough to let me over look this minor violation of my self-imposed rules. Kenon, along with George Gervin and James Silas, were the original Spurs. Their high level of play helped to solidify the team in San Antonio during those first few years after the team joined the NBA. They helped the young team qualify for the playoffs in their first year in the league and by their second, had already given San Antonio it’s first division title. 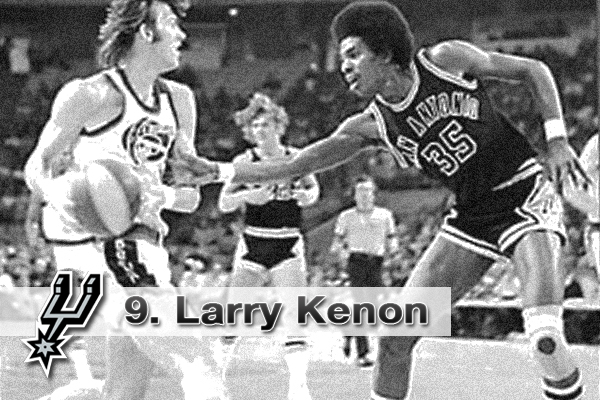 Between the ABA and NBA, Kenon made 5 All-Star Teams and finished his career with 12,954 points and 6701 rebounds. We’re just days away from Bruce Bowen‘s official jersey retirement ceremony, which in and of itself should be enough to tell you just how good of a player Bowen was for the Spurs. Yes, he never put up the numbers that some of the players below him on this list did and he was never even the third best guy on any of the Spurs teams he played for. So why does he make this list? And when it came to defense, no one was better than Bowen. Some called him a dirty player, but I think that had more to do with their frustration after a night of having him draped all over them. Let’s face it, as good as those Spurs teams where from 2001-2009, they would never have won 3 championships without Bowen’s constant, hounding style of defensive play. And let’s not forget that if you got him the ball in the corner he was guaranteed to give you three points. He might have only had one shot, but man was he money with it. 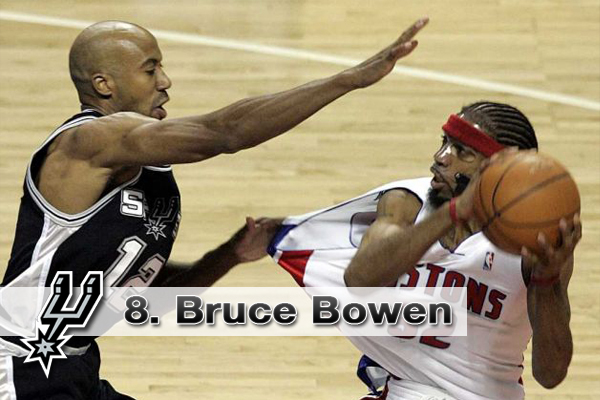 Bowen finished his Spurs career with 5 All Defensive Team selections and 3 Championship Rings. Not bad for a guy who started his career playing for Le Havre in France. 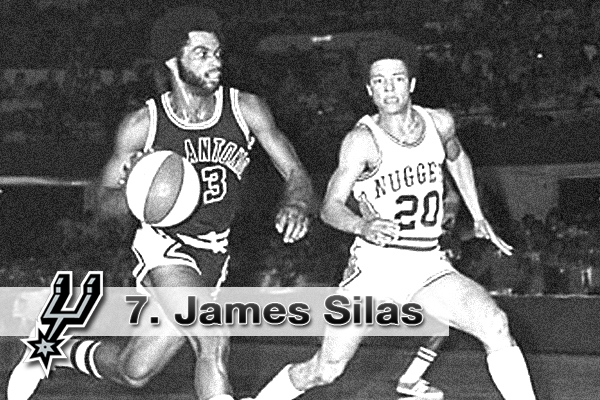 I chose Silas at number 7 ahead of his team mate Larry Kenon, because unlike Kenon, Silas played the majority of his career with San Antonio and while he made fewer All-Star teams (2 ABA All-Star selections) his over all numbers are fairly comparable to Kenon’s numbers. As you may notice from the inclusion of Silas, Kenon, and Gervin on this list, the Spurs team in the late 70s that Silas played for was a very formidable bunch. It was a team that was probably one good big man away from contending for a title too bad that big man, Artis Gilmore arrived too late and past his prime. All told, Silas recorded over 11,000 points and just under 6,000 assists during his 10 year NBA Career. 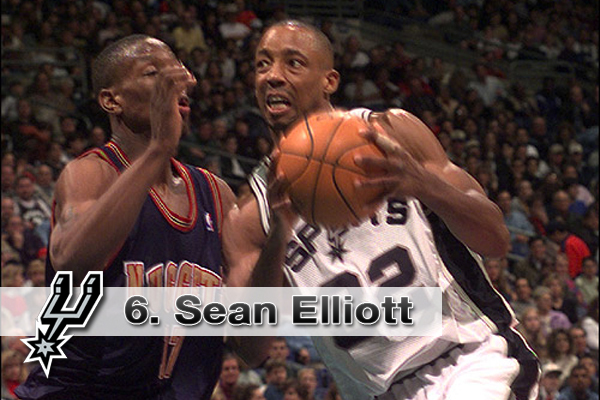 Heart is the key ingredient that takes a good player and elevates them to greatness, and Sean Elliott had a crazy big heart. His will and determination to win in the face of life threatening kidney problems helped carry the Spurs to their first NBA Championship and the rest is history. Heck, in my opinion, the Memorial Day Miracle alone should be enough to get him a spot on this team. Except for one year, Elliott played his entire career in a silver & black uniform. While never a huge scoring threat, Elliott was a great complement to David Robinson and made two All-Star teams. I found it funny, that on the day that Tony Parker exploded for 42 points against the NBA’s best team (OKC) and set the Spurs record for career assists, the story didn’t even make the front page on ESPN. Instead, everyone was busy watching a below .500 Knicks team beat up on a below .500 Nets team and the Linsanity continues to this day. Parker is a horribly underrated player, who gets very little attention because he plays in San Antonio and has Tim Duncan and Manu Ginobili as teammates, but don’t be fooled, TP is an all time great. Remember, Parker is only 29 and more than likely still has 4-5 good years of basketball left in him. Over the years that the big three have coexisted in San Antonio, Parker has flip-flopped with Ginobili several times for the title of second best player on the Spurs roster and when it is all said and done, he may very well pass the Argentinian on the list of Spurs greats. Parker has made 4 All-Star rosters and won 3 Rings including the 2007 Championship in which he took home Finals MVP honors. The “Iceman”, the original Spur, and the first San Antonio player to gain entrance into the Basketball Hall of Fame. As noted earlier, Gervin played an integral role in insuring that basketball in San Antonio was a success. He helped to develop a winning culture in the Alamo City that is almost unparalleled by other NBA teams. 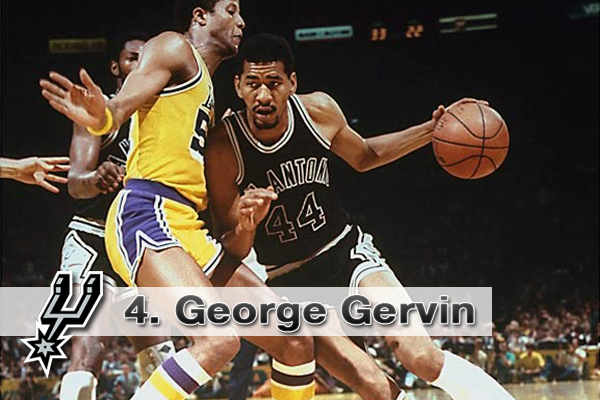 A scorer at heart, George Gervin was a 4 time scoring champ who made the All-star team 9 times. When ABA stats are taken into account, he is still the Spurs all time leading scorer with 26,595 points. Gervin was also named to the NBA 50th Anniversary Team along with fellow Spur David Robinson. You may be thinking, wait a minute, both Parker and Gervin have better stats and more accolades than Ginobili, and you’d be right. 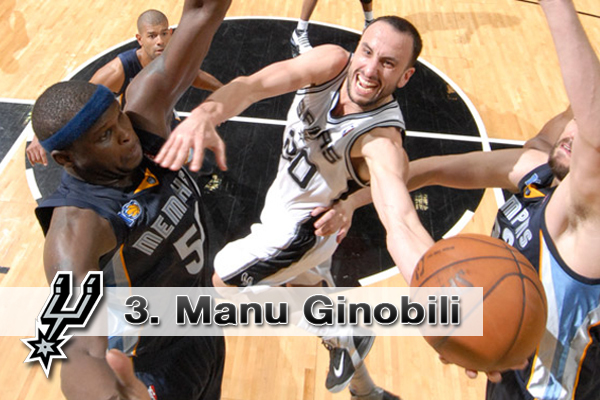 Despite their over all numbers, however, I would argue that Manu at his best was better than both of them. There’s only about three or four players in the NBA that have played with the kind of “will to win” attitude that Manu does on a night in night out basis. Jordan did, and Kobe does and there is probably a few others I am forgetting, but that’s it. Manu quite simply, plays with the heart of a champion. He leaves it all out there on the floor, sacrificing his body in order to secure a win for his team. In doing so, he’s become one of only two players to ever win an NBA Championship, a Euroleague Title and an Olympic Gold Medal. Where ever he’s gone, Ginobili has won. As further proof of just how important Manu was to the Spurs Championship teams, as soon as he started to get injured frequently in 2008, San Antonio stopped winning titles despite a continued high level of play from both Duncan and Parker. The Argentinian super-sub who has selflessly come off the bench whenever Greg Popovich has needed him to, has won the sixth man of the year award, been named to 2 All-Star teams and 2 All NBA Third Teams. There really was no debate when it came to selecting the top two spots on the Spurs’ All-Time Roster. An all round good guy, David Robinson, “The Admiral”, played his entire career with the Spurs, going out a winner after the 2003 Championship season. When Robinson first arrived in San Antonio, the Spurs where in bad shape. In the four years preceding his arrival, the Spurs record was 115-213. As a small market team, San Antonio was unable to afford the dwindling local interest that came with having a losing product on the court. Then as ping-pong balls would have it, the Spurs landed the number 1 overall pick in the 1987 draft, a pick they used on Robinson. 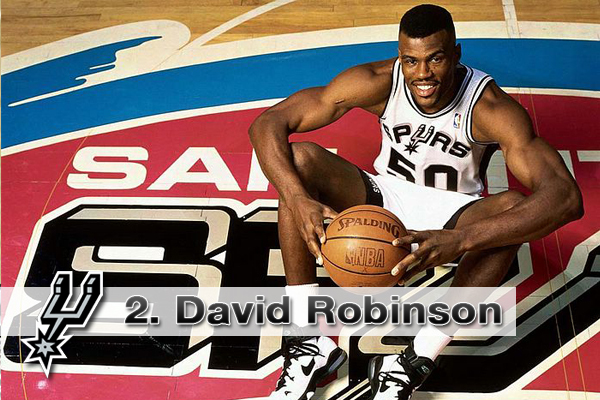 After a two year commitment to the U.S. Navy had been fulfilled, Robinson entered the NBA in 1989 and in one season completed shifted San Antonio’s fortunes. He unanimously won the rookie of the year for his efforts and went on to anchor the Spurs rotation for the next decade and a half. A small sampling of his awards and records includes, the 1995 NBA MVP, 2 Championships, 10 All-Star appearances, 10 All-NBA honors, the 1992 Defensive Player of the Year Award and a place in the Naismith Basketball Hall of Fame. To top this all off, Robinson has always been an incredible human being who is just as great off the court as he ever was on it. His charitable contributions to the City of San Antonio are without peer a fact that the NBA recognized when they named their charity award after the Admiral. What is there to say about “The Big Fundamental” that hasn’t already been said a hundred time. Tim Duncan is without question the greatest Spur of all time and the most complete power forward with game has ever seen. The fact that the Spurs landed Duncan with the 1st over all pick in 1997 while Robinson was still so close to his prime is almost a joke. Other franchises wait years between franchise defining players, and the Spurs had two of them on the same team! Tim Duncan’s greatness was enhanced ten fold by the way he carried himself. 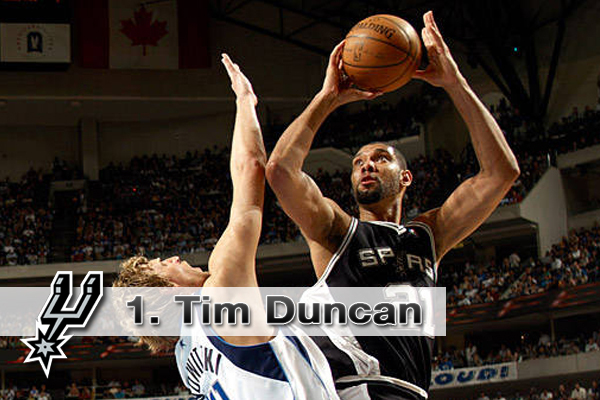 Never one for flash, pomp, or circumstance, Duncan let his playing do the talking and boy could he play. Even now, in the twilight of his career, we still see flashes of his brilliance. He still hits his signature bank shot and pulls down 10 plus boards a game with a quite easy that is uncanny. Throughout his career Duncan has always looked to improve his game and as his body has deteriorated, his basketball I.Q. and years of accumulated knowledge have continued to keep him going well past his prime. Duncan has won 2 NBA MVPs, 3 Finals MVPs, been selected to 13 All-Star appearances, made 13 All-NBA Defensive Teams, 13 All-NBA honors, and won 4 Championships. Tim Duncan is as good a basketball player as has ever played the game and would be the starting power forward on any All-Time NBA team no matter who you put him up against. Looking back over the Spurs players in the top 10, San Antonio’s All-Time team has to be considered one of the most formidable out of all 30 NBA teams. I think they are deeper than the Bulls (remember, Derrick Rose hasn’t been there long enough yet to qualify). The Pistons and 76rs might come close, but I still like the Spurs chances in a head to head match up. In fact, I’d have to do more research to really present a compelling case, but I think top to bottom, you would have to rank the Spurs 3rd (or fourth at worst), behind only the LA Lakers and Boston Celtics. Not bad for a small market, one sport town. hOur company offers a wide variety of non prescription drugs. Take a look at our health site in case you want to look healthier with a help health products. Our site offers a wide variety of non prescription products. Look at our health site in case you want to to improve your health with a help of health products. Our company offers a wide variety of non prescription drugs. Look at our health portal in case you want to look healthier with a help of generic supplements. Our company offers a wide variety of non prescription products. Visit our health website in case you want to strengthen your health with a help of health products. Our company offers supreme quality non prescription products. Look at our health contributing website in case you want to improve your health. Our company provides a wide variety of non prescription products. Look at our health contributing portal in case you want to look better. Our company provides a wide variety of non prescription drugs. Look at our health site in case you want to strengthen your health. Our company provides supreme quality health products. Visit our health contributing website in case you want to improve your health. Our company offers a wide variety of non prescription drugs. Visit our health website in case you want to look better with a help generic supplements. Our company provides supreme quality supplements. Take a look at our health contributing website in case you want to feel better. Our site offers a wide variety of non prescription drugs. Take a look at our health website in case you want to strengthen your health with a help of generic supplements.